We’ve been working with some art people lately. 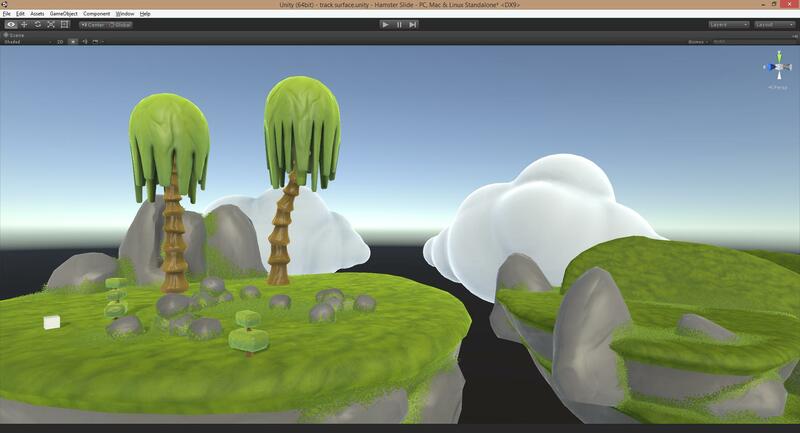 Here’s a work-in-progress test scene for style/rendering in one of our upcoming VR games. I put the moss in today – it’s an important thing because along with some more carefully-planned layouting, this game is also going to involve spawning lots of art assets and jamming them together (most commonly, rock and island formations). Thomas, the art guy, noticed that the intersections between the models were looking kinda janky, so we’re adding some moss to the creases to help hide the seams. Coverage is calculated and stored in vertex data (like an AO bake) when the scene loads, after everything has finished spawning. I haven’t optimized it yet, but baking coverage for this test scene takes less than one second on my laptop, so hopefully that’s an indication that it’ll scale nicely when dealing with larger scenes (because this game has by far the biggest play areas of anything I’ve made so far). The moss is rendered onto extruded shells of the original meshes, which display slices of worldspace simplex noise. Once again, twitter is generally going to be a better way to keep up-to-date this stuff.